"The SecureUSB2.0 is a fantastic device for those of us who travel and have a great deal of sensitive customer data on our laptop hard drives. It gives you additional storage space as well keeping the data secure even if the drive is lost." 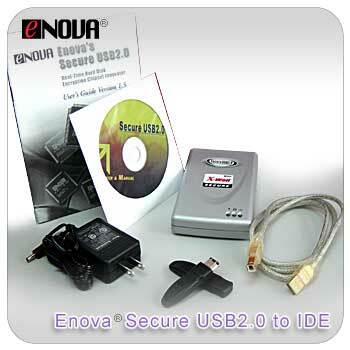 Enova®'s X-Wall solution completely eliminates the traditional trade-offs between speed, convenience and security. X-Wall performs automatic and transparent hardware based "real-time" encryption at an unprecedented 1.6 Gigabit per second, requiring no user intervention. This ensures users never experience any performance degradation, with systems functioning at exactly the same speed as before X-Wall was installed. 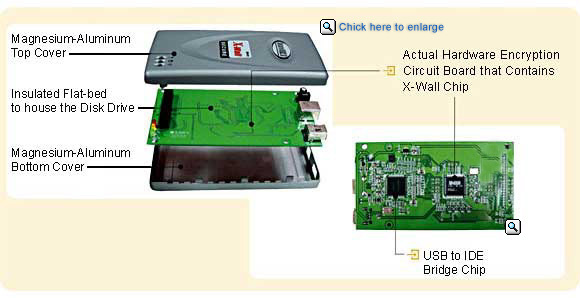 The X-Wall Secure Key stores and protects the encryption key used by the X-Wall microchip to encrypt data. The correct X-Wall Secure Key must be inserted into the special key socket (present on X-Wall finished products) at system boot up to authenticate the user and authorize the operating system to load before granting access to data stored on the hard drive. - Supported operating systems: Windows 98/98SE/200O/Me/XP, Mac OS, Linux 2.4 and above. - Power requirement: +5V (power from the USB host, or from power adapter). SD-250, USB Cable, Power Adapter, Secure Key x 2, User's Guide, Driver & Manual CD-ROM, Pouch for Carrying SD250 and accessories, Retail Box.